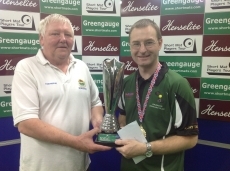 The first singles event of the 2013/14 Short Mat Players Tour season, sponsored by Henselite UK, saw 120 players from 6 countries descend on the tours new home at Bromsgrove IBC for the UK Open. The event was staged on 21 portable mats, including 16 Greengauge Tour Mats (designed especially for the SMPT). After a full weekend of intense action the final would be contested between Jal Richardson and Joseph Beattie. After 2 ends, Jal led 2-1 but then Joseph stepped up a gear and with Jal struggling to get bowls close, Joseph soon opened up a 5 shot lead by the conclusion of end 5. Jal was now being forced into an aggressive game and duly killed the 6th end and took a single on the replayed end to trail 7-3. This however seemed to be a fleeting effort as Joseph powered to 5 shots over the next 2 ends to lead 12-3. With ends running out for Jal he tried to gain the momentum once more but a stunning 3 shots on the 9th end for Joseph meant an early end to the match and a convincing 15-3 victory and his second SMPT ranking title.